Venezuelan President Hugo Chavez is suffering from cancer and had again surgery in Cuba. He will need further radiation treatment but is still hopeful to survive. WikiLeaks published emails from Stratfor Global Intelligence which suggest, that the health condition of Hugo Chavez could be worse than known until now, with possible carcinogenic tumors in both prostate and colon, and a potential metastasis to lymph nodes and bone marrow. According to these emails Russian doctors expect him to die within a year, while Cuban doctors give him another two years. Commentators in Western media already delight themselves in post-Chavez scenarios. This is welcome news for the USA and Europe, because Chavez supported independence seeking governments not only in Latin America but around the world and was a considerable annoyance and an impediment to neocolonial exploitation. Paraguayan President Fernando Lugo was diagnosed with non-Hodgkin lymphoma cancer in August 2010. Current Brazilian President Dilma Rousseff was treated for early stage lymphatic cancer in 2009, her predecessor Lula da Silva just finished chemotherapy for throat cancer. Cristina Fernandez, the President of Argentina, had her thyroid removed on January 4 only to find out that the gland wasn’t cancerous after all. Doctors can’t put it back, and Cristina Fernandez will be on thyroid hormone replacement medication for the rest of her life. In 2010, a study published in the Journal of the National Cancer Institute found that cancer over-diagnosis is a growing problem that is hardly being addressed. At least one-quarter of all mammograms and about 60 percent of all prostate cancer screenings come up with false positives, which result in needless surgeries and life-altering treatments. On the other hand, according to the US National Cancer Institute, incidences of thyroid cancer have nearly doubled since the early 1970s. Thyroid cancer now affects about 11 people per 100,000 in the USA. In 2011, 56,460 new cases were diagnosed. In January 2008, there were 458,403 Americans alive who had a history of thyroid cancer, of which 100,952 were men and 357,451 women. In 2011, 56,460 new cases of thyroid cancer were diagnosed and 1,740 people died. Cancer is worsening in China, where it causes an annual 2.1 million deaths. The cancer mortality rate in China is about 144 per 100,000 people, according to the WHO in Geneva. That compares with 123 per 100,000 in the USA, 135 in the U.K. and 76 in India. According to WHO estimates, every fifth person in China will get a malignancy — most likely lung, stomach, liver, esophageal, or colorectal cancer — before age 75. The USA is better off than China, and the American Cancer Society reports that between 1999 and 2008 cancer death rates fell by more than one percent per year. This year, an estimated 1,639,000 people will be newly diagnosed with cancer and 577,200 people will die from it. Death from lung, colon, breast, and prostate cancer (the most common forms of cancer) declined, which is attributed to better screening and less smoking. Cancers of the pancreas, liver, thyroid, kidney, melanomas, esophageal cancers, and throat cancers increased. Cancer in the USA increased steadily between 1973 and 1996, and the surge was consistent across most types of cancer, from breast cancer with 1.5 percent per year, to prostate cancer, skyrocketing at 4.4 percent per year. Cancer overall rose by 1.1 percent per year, meaning about 11,000 more cancers per million people each year. In the 20 years from 1975 to 1996, childhood cancer rates in the USA rose 20 percent, from 128 cases per million children in 1975 to 154 cases per million in 1996. Between 1992 and 1996, 20 of every 100,000 preschool-age children age four and younger were diagnosed with cancer. Leukemia, the most common childhood cancer, increased by about 17 percent between 1973 and 1996 (from 23 to 27 cases per million children), brain and other central nervous system tumors in children rose by 26 percent. According to WHO statistics from 2012, cancer is a leading cause of death worldwide, accounting for 7.6 million fatalities (around 13 percent of all deaths) in 2008. Lung, stomach, liver, colon, and breast cancer are the most common cancers. Some 70 percent of all cancer deaths in 2008 occurred in low- and middle-income countries. Deaths from cancer worldwide are projected to rise further, reaching an estimated 13.1 million deaths in 2030. There are troubling signs that we are at the beginning of a cancer pandemic and that the WHO projections of only 13.1 million death in 2030 are overly optimistic. 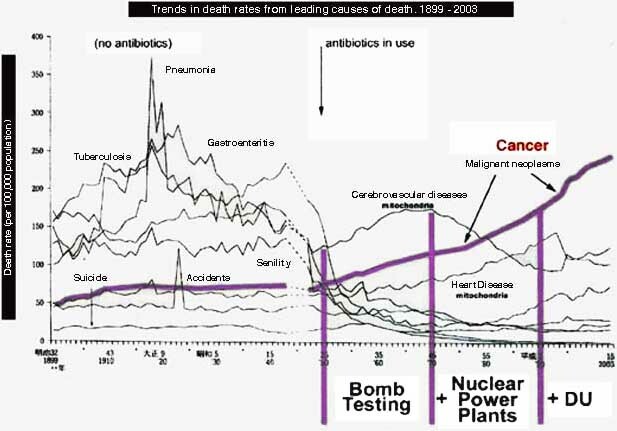 I mentioned the possibility of a looming cancer pandemic already several times on this blog and as an environmentalist and cancer survivor I have a very personal interest in this subject. Cancer can be a terminal illness and even if the treatment is successful and the cancer appears to be cured, the illness can reemerge at any time and every relapse greatly diminishes the survival chances. I went through 4 cycles of CHOP chemotherapy, a treatment which seems to have cured my Non-Hodgkin’s Lymphoma cancer, but the treatment was uncomfortable — to say it mildly. My hair grew again but I suffered from side effects for many years. Hair loss, nausea and vomiting, diarrhea or constipation, appetite loss, mouth sores, skin rashes, insomnia, mood swings, headache, dizziness. Long-term effects may include increased risk of infections, heart damage, possible second cancers. This post was inspired by the transcript of a very interesting radio show, published in two parts on nsnbc.